Follow the White Bunny: Winter Forest Quilt nearly done! Winter Forest Quilt nearly done! I had read so many positive reviews of the Aurifil quilt threads in the past year that I had to try it as well. I kind of hoped it had magical powers so I would instantly be a fantastic Free Motion Quilter! Of course that is not quite what happened but I do like the Aurifil thread. 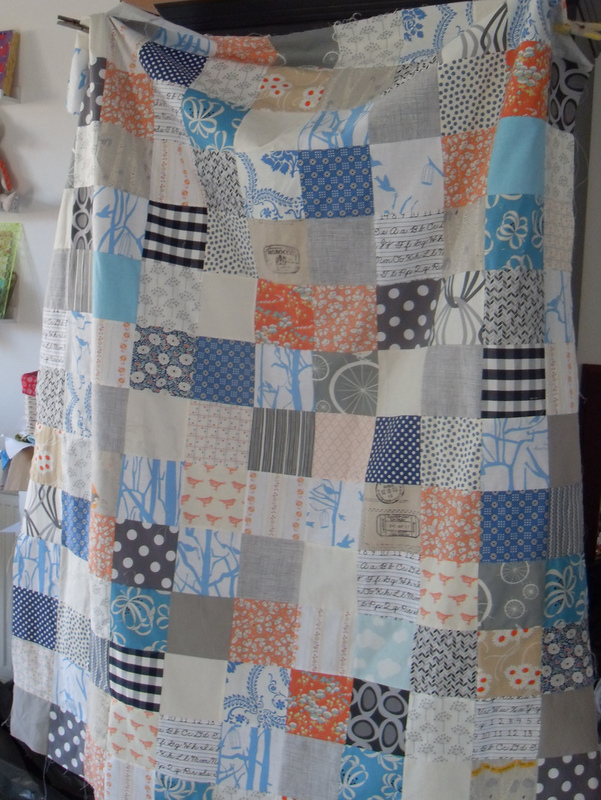 Also I had a whole quilt to practice on and some parts (see top picture) were not as bad as others. I made a crazy loopy design and despite some puckering (and even a bit of un picking at some point) some odd angular loops, stitches that differ significantly in length etc etc I'm not unhappy with the result. Now I need to decide on the binding. I think either a dark shade of blue or a mid-orange maybe? Any thoughts/advice on the issue is more than welcome! love your quilt! The colours are just fabulous. I would probably go for an orange binding to really make it pop. Thanks! well orange it is then :) I think I will order some Kona will try and find a good match on my Kona colour chart. 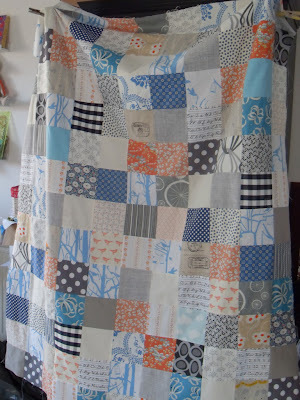 I really like your quilt and am looking forward to seeing it all finished. I think orange would look great on the quilt binding! I really like the colorway you chose, Nicole. I agree that orange binding would make that quilt "pop"! I think I've found the right fabric for the binding and orange it will be! :) Thanks for your thoughts everyone!